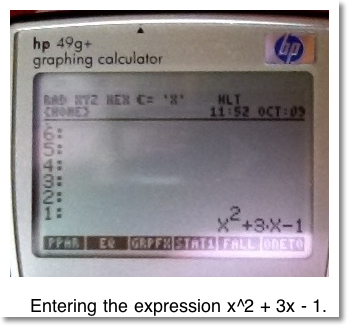 Welcome to Part 17 of the RPL Tutorial for the Hewlett Packard 49g+ and 50g calculators. Today we will work with flags. There are two types of flags: system and user flags. User flags do not have any pre-defined meaning except for what the programmer gives them. User flags are flags 1 through 127. System flags are the flags that set the various modes of the calculator, and they are -1 to -127. Depending on how these flags are clear (turned off) or set (turned on) dictate how the calculator operates. [F1] (SF) - Set Flag. Turns the flag on. The flag number is on level 1 of the stack. [F2] (CF) - Clear Flag. Turns the flag off. The flag number is on level 1 of the stack. [F3] (FS?) - Set Flag Test. Tests if a flag is set. Returns 1 if the flag is set, 0 if it isn't. [F4] (FC?) - Clear Flag Test. Tests if a flag is cleared. Returns 1 if the flag is cleared, 0 if it isn't. [F5] (FS?C) - Tests if a flag is set - then clears the flag regardless of the result. [F6] (FC?C) - Tests if a flag is clear - then clears the flag regardless of the result. A very handy pair of programming commands is PUSH and POP. Both commands are found in the catalog. These commands allow the user to save the calculator's mode settings with PUSH, change them during program execution, and recall them with POP. [F1] (PRN): The principal root. This is the root that most, if not all, calculators return if the xth root (x√y) command is used. For square roots, this is the positive square root. [F2] (REAL): All real roots to be returned. Real mode is set during execution. [F3] (ALL): All roots, real and complex, to be returned. Complex mode is set during execution. 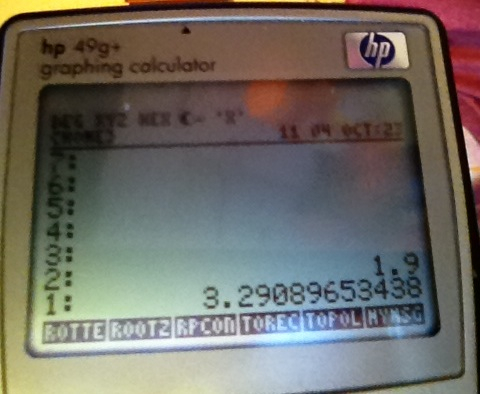 ROOTZ also purges the variable X and sets the calculator to Approximate mode. Caution: ROOTZ works with real radicands (y). Complex radicands will return errors or undesired results. Complex numbers are displayed as coordinate pairs (real part,imaginary part). This concludes Part 17 of our RPL tutorial. Until next time, happy programming, Eddie. This tutorial is property of Edward Shore. Mass reproduction and distribution requires express permission from the author. Welcome to Part 16 of the RPL programming tutorial. Today we will work with CHOOSE boxes. Note: The CHOOSE box is not available on the HP 48S and HP 28C. The first two programs, TOREC and TOPOL, will be the subroutines that will be used in a third program, RPCONV. "title of the choose box"
The KILL command stops program execution. Now that TOREC and TOPOL are complete, let's do the main program, RPCONV. We made TOREC and TOPOL global programs, so they can be used on their own. * Titles the choose box "Converter"
* First menu choice, →POLAR. TOPOL is typed. * Second menu choice, →RECT. TOREC is typed. 1. Convert r = 3.8, θ = 30º to rectangular coordinates. 2. Convert x = 3.2, y = 6.3 to polar coordinates. Below are screen shots of Example 1. Next time we will explore system flags. 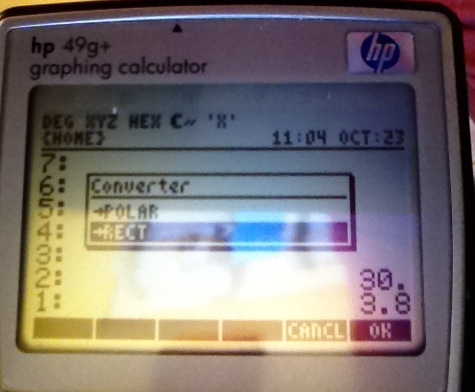 Welcome to Part 15 of the RPL Programming Tutorial for the HP 49g+ and 50g calculators. Today, we will be working with strings and the MSGBOX command. MSGBOX takes a string and displays it as a message box. You can turn in a result into a string (as we will do in the MOPMT program later) and display it in a message box. Note: The MSGBOX command is not available on the HP 48S or 28C. While entering strings, you can type both upper and lower case letters, insert additional lines, and join multiple strings together. Press [ALPHA] once to type in one upper case letter or any of the numbers on the numeric keypad. Press [LS] [ALPHA] once to type in one lower case letter. The numeric keypad gives some special characters not marked on the keyboard. Press [RS] [ALPHA] to get access to some Greek characters. The numeric keypad gives some special characters not marked on the keyboard. Pressing [ALPHA] [ALPHA] turns ALPHA-LOCK on. While on ALPHA-LOCK, pressing [LS] [ALPHA] will switch between upper-case character lock and lower-case character lock. It is a good idea to reset ALPHA-LOCK to upper-case before exiting ALPHA-LOCK. Press [RS] [ . ] ←| (it looks something like this) starts a new line in the string. Join two strings together by "adding" them. ( [ + ] ). Level 2: "left string "
Level 1: "right string "
Level 1: "left string right string "
[RS] [ 2 ] ! [RS] [ 3 ] ? Part 15 will feature two programs: MYMSG and MOPMT. MYMSG: Types a simple message. MOPMT: Finds a monthly payment given the number of years, loan amount, and the annual interest rate. Comments will be italicized, starting with an asterisk *. This program asks for the loan amount, the length of the term in years, and the annual interest rate and returns the payment in a message box. * Joins the two strings. 5. A message box displays the monthly payment. Find the monthly payment on a $256,000, 36-year loan with a given interest rate of 3.7%. Next time we will work with handy conversions and using choose boxes. Programs are enclosed with "pointy" brackets ( << >> ). All the programming instructions are included with a set of brackets. These brackets include subroutines. Caution: This can be used in only simple cases - such as storing numbers to variables. Put the purge instruction at the end of the program. During execution, the prompt will be at the top of the screen. Enter what the program requires and then press [LS] [ON] (CONT). You may want to make a separate program to purge the variables used int he program when using STEQ 30 MENU. Enter subroutines at the beginning of the program. Purge it at the end. This action replaces any previous contents of CST. A very handy pair of programming commands is PUSH and POP. Both commands are found in the catalog. XRNG: Sets the left and right boundaries of the plot screen. YRNG: Sets the bottom and top boundaries of the plot screen. 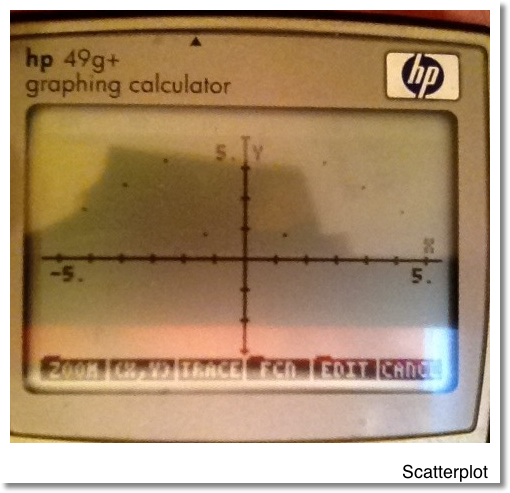 FUNCTION: Sets the calculator to the Function graphing mode (y(x)). STEQ: Stores an equation, program, or expression into the EQ variable. EQ is used for graphing and/or solving. INDEP: Sets the variable as independent. The variable is usually X, but can be T, N, Θ, or any other variable. ERASE: Erases the plot screen and gets the calculator ready to draw a fresh, new plot. DRAW: Has the calculator draw whatever is stored in EQ. 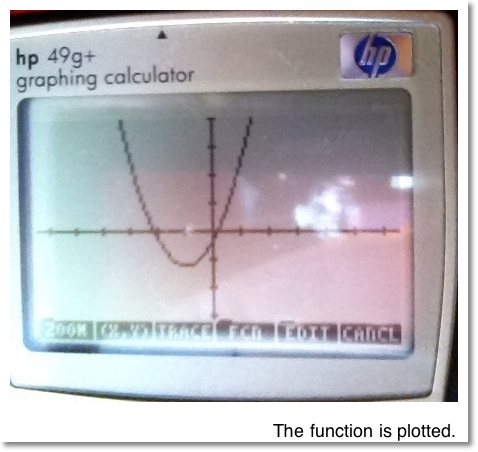 PICTURE: Switches the calculator to the plot (picture) environment. Plenty. Part 14 will have three programs that illustrate some of what we have learned so far. One point that I really want to stress: with the HP 49g+ and 50g containing over 2,300 commands; so we have not even scratched the surface! If you have not already, I recommend that you download the HP 50g Advanced User's Reference Manual from Hewlett Packard's website. This manual contains the syntax for ALL of the commands for the 50g and 49g+. The first section also has a section on programming with additional programming examples. It is a really good reference book; I have a copy on my iPad that I can access through iBooks for handy reference. 1. PDM: Test to see if a matrix (with real eigenvalues) is a positive definite matrix. 3. SCTR: Scatterplot of data. Where z^T is a transpose of the vector z.
then M is a positive definite matrix. Caution: This program gives the error message "> Error: Bad Argument Type" if M has complex valued eigenvalues. Do not conclude anything from the use of PDM if this is encountered. One of the safest ways to clear errors is to press [ON]. ==: The comparison does x = y? returns 1 and is a positive definite matrix. has complex eigenvalues and error condition (comparing complex numbers to real numbers) occurs. No conclusion. returns 0 and is not a positive definite matrix. This program returns a coordinate in a translated and rotated coordinated system. NEG: Negate - used when the user presses [+/-] in a program when the sign is not attached to a number. All the examples are in degrees mode. This program takes data from two lists, with a list of x-coordinates listed on Level 2 and a list of corresponding y-coordinates listed on Level 1. 1. Enter a list of x-coordinates. 2. Enter a list of corresponding y-coordinates. 3. Run SCTR. Adjust the plot screen if necessary primary to running SCTR. That concludes Part 14. I hope you are having as much fun learning about RPL program as I am typing the tutorials. This tutorial is property of Edward Shore. Mass distribution and reproduction requires express permission of the author. This may be Part 13 of our RPL tutorial, but it is not going to be an unlucky section (knock on wood). Today, we will create a custom menu and use it for programming. The calculator contains a custom menu, which can contain as many commands as you want, and whatever commands and programs you want. The custom menu can be changed at any time to fit your needs. The contents of the menu is a list of contents stored in the variable CST. The custom menu can be accessed by the key sequence [LS] [MODE] (CUSTOM). Best of all, the custom menu can be accessed during program. 1. Have the menu ready at Level 1 on the stack. 2. Press [ ' ] [LS] [EVAL] (PRG) [NXT] [F4] (MODES) [F5] (MENU) [F2] (CST). In the program QREG (Quadratic Regression), we will develop a custom menu to assist us. The QREG takes a two-column matrix, with the first column acting as the x-variable (dependent) and the second column acting as the y-variable (independent) and attempting to find a quadratic fit (see the equation below) of the data by the least-squares method. Please be aware that QREG is a large program; please take your time with entry. I recommend that you set up the suggested custom menu first - it will save a lot of keystrokes during the entry of the main program. We are going to do things in a little different order in Part 13, starting with the finished program and then let's deal with the keystrokes needed. Note that the commands AXL, STO∑, TOT, PICK, GET, and &#8594LIST appear frequently. Let's make a custom menu with these six commands before we start programming QREG. * Stores the custom menu. AXL: a toggle. AXL changes a list to a vector. AXL changes a vector to a list. STO∑: stores a matrix into the variable ∑DAT. ∑DAT is used for statistical analysis. TOT: Totals each column of ∑DAT. ->COL: Matrix to Columns command. Extracts a column from a matrix. COL->: Columns to Matrix command. Transfers a given set of column vectors to a matrix. ROW->: Rows to Matrix command. Creates a matrix from a given set of row vectors. RREF: Calculates the row-reduced-echelon form of a matrix. TOT will be used to extract the sums of the columns. This assumes that you have the custom menu set up as discussed above. * First row of the normal equations is formed. The next two equations are formed in the similar way. * Extract the column [a, b, c] and terminates program entry. 1. Enter a two column matrix. One way to enter matrices is to use the calculator's matrix writer by pressing the sequence [LS] [ ' ] (MTRW). To enter the matrix, press [ENTER] after entering the last element. To cancel matrix entry, press [ON]. If the matrix is an identity matrix of size 3 ([[1,0,0][0,1,0][0,0,1]]), then a definite solution has been found. Have fun fitting other sets of data to quadratic equations. Next time I will present additional programming examples. Keep on programming, Eddie! This tutorial is property of Edward Shore. Mass reproduction and distribution requires express permission by the author. Welcome to Part 12 of the RPL Tutorial. In Part 12, we will cover subroutines. A subroutine is a named routine defined in the program, which is saved for later use. the subroutine is called whenever the need arises. The program presented in Part 12 will illustrate using a subroutine and a START-NEXT structure. In this program, we are going to pick d integers from low (l) to high (h) - allowing the choices to repeat. SUB1 will be called up in the START-NEXT loop. To build the list, the stack is cleared, allowing the program to fill it with draws. Once the draws are complete, DEPTH →LIST will be used to create the list. * Enters the prompts for H, L, and D.
5. Obtain a list. Use [HIST] [F2] (VIEW) to see the list. This tutorial is property of Edward Shore. Mass reproduction and duplication requires express permission of the author. Part 11 of our tutorial will cover the CASE structure, which is really the IF-THEN-ELSE-END structure repeated more than one time. The default commands are optional. If there is no default commands, the structure ends without any action. Note that CASE is only needed once, and there must always be a final END to this structure. CASE is found in the PRG-BRCH menu. Use this key sequence as a starter. Use this key sequence to add additional cases. Remember only one CASE is needed per structure. →TAG automatically adds a colon ( : ) to the label. A tagged object (number) can be used in any calculation like normal. However once a calculation is executed, the tag is lost. Here the tax preparer wants to know how much is the tax liability. In addition, the preparer wants to label both the income and tax liability. Case 2: If 15,000 ≤ income < 100,000, then calculate income above 14,999 * 7% + 1050, We'll break up the condition for Case 2 this way: 15,000 ≤ income AND income < 100,000. * Apply the tag on the income tax. * Apply the tag on the income. 1. Enter the taxable income. This wraps it up for Part 11 - on to Part 12 where we work with a subroutine. Until next time, Eddie. Do It Until It's Done! 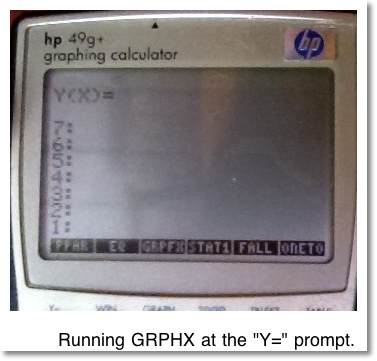 Welcome to the third week of my RPL tutorials for the HP 49g+ and 50g Hewlett Packard graphing calculators. We will start this batch of tutorials with Part 10: the Do Loop. The DO-UNTIL-END loop structure works like the WHILE-REPEAT-END loop structure except instead of repeating a bunch of designated commands while a certain condition is met, this time we are repeating a bunch of designated commands until a condition is met. Let's illustrate a use of a DO-UNTIL-END structure with a simple program: have the calculator generate a bunch of random numbers until the sum of 1 is reached. [RS] is the right shift key, 2nd key up from the ON button on the left side of the keyboard. [RS] is red on the 49g+ and orange on the 50g. [LS] is the left shift key, 3rd key up from the ON button on the left side of the keyboard. [LS] is green on the 49g+ and white on the 50g. [ALPHA] is the 4th key up from the ON button on the left side of the keyboard. On both the 49g+ and the 50g, the key is yellow. Pressing [ALPHA] twice puts the calculator in ALPHA-LOCK mode. [big X] is the "X" key on the 4th row from the bottom, 3rd from the left. This is so I distinguish X from the times key ([ x ]). Finally, the soft keys labeled F1 - F6 are on the top row. This program will keep adding random numbers until the sum exceeds one. Comments are italicized beginning with an asterisk. Here we go! * Inserts the first random number. RAND always enters numbers between 0 and 1. That wraps up Part 10 of the RPL Tutorial Series. Next time, we'll look at the CASE structure. See you then! Today in Part 9, we will create two programs where menus are created. The first one is a simple program involving free fall. The second program is a more complex menu that allows users to easily enter statistics and perform simple analysis. Creating menus in RPL is not hard - but you really have to keep track of what you are doing because it can be easy to be lost in the symbols that are involved. These two programs may the ones to insert line breaks (done by [RS] [ . ]) to make program entry easier to see. In Part 9, we will use the simplified structure in both the programs. Either of the structures are followed by either MENU or TMENU. MENU: Creates a user-defined menu and also replaces the calculator's custom menu for future use. To access the custom menu, press [LS] [MODE] (CUSTOM). TMENU: Works the same as MENU except the user menu does not replace the calculator's custom menu for future use. This program calculates the length of a free fall of an object dropped straight down in either feet or meters. The gravitational constant is determined by the desired measurement. Air resistance is ignored in this calculation. Comments are italicized and start with an asterisk. This program assumes the time (in seconds) is on Level 1. * The [RS] [ . ] sequence is the carriage return sequence and is not required. I just put the sequence in here to program entry look better. * Creates the first menu key "FT"
* The commands associated with "FT"
* Creates the second menu key "M"
* The commands associated with "M"
* Exits the second nested list and the menu structure. * Enters the TMENU command - you can use the MENU command (F1) desired. Doesn't look that complicated does it? 1. Enter the time in seconds. 3. Select either [F1] for distance in feet, or [F2] for distance in meters. I am going to drop an egg from a building. The fall lasts 3 seconds. How far did it go? * [F2] (∑+) enters the next data point and clears the stack. It also returns the number of data points in the statistics data matrix. * [F3] (∑-) deletes the latest data point and clears the stack. It also returns the number of data points in the statistics data matrix. * [F4] (MEAN) calculates the mean of each column of the statistics data matrix. * [F5] (SDEV) calculates the standard deviation of each column of the statistics data matrix. * [F6] (SUM) calculates the sum of each column of the statistics data matrix. The statistics data matrix is the system variable ∑DAT. The key sequence [RS] [ . ] inserts a carriage return to improve readability of program entry and is not required. * To type "∑+ "
* To get in between the two right list brackets } } - just two menu commands to go! * [F2] (∑+) enters the next data point and clears the stack. It also returns the number of data points in the statistics data matrix. For entering multi-variate data, see the hint below. In STAT1, you can enter multivariate data. To do so, first clear the statistics matrix. Then for each point, press [LS] [ x ] ( [ ] ). Separate each point with a comma or space. The press [F2] (∑+). You can operate the other commands (∑-, MEAN, SDEV, SUM) like normal. A research company compiled retrieved a list of the last 15 winning amounts from a popular, long-running game show. The company wants to find the average winning amount, it's deviation, and the total amount won. Remember you can remove the last data point entered by pressing [F3] (∑-). [F1] (CLST) - display says "ALL CLEAR"
[F4] (MEAN) - $21,340 is the average amount won. This ends Part 9 of the RPL Programming Tutorial. Until next time, Eddie. This tutorial is the property of Edward Shore. Mass reproduction and distribution requires express permission of the author. Welcome to Part 8 of the RPL Programming Tutorial. Today, we will cover the WHILE-REPEAT-END programming structure. This structure is similar to the WHILE-WEND programming structure in BASIC. In this loop certain commands are repeated while a condition is true. This program takes the absolute number from the stack. As long as the number is greater than 1, the program keeps dividing the number by 2. Note the use of DUP in this program. The DUP (Duplicate) command duplicates the contents of Level 1. It is necessary because tests consume the contents of levels 2 and 1. This concludes Part 8 of our tutorial. Next time, we will create custom menus. It's going to be a lot of fun! Until next time, Eddie. This tutorial is property of Edward Shore. Mass duplication and reproduction requires express permission from the author. How Do You Solve This Thing Again? 1. The first step is setup the equation. We can set up the equation either as an Algebraic object or an RPN program. 2. We follow the equation by the commands STEQ 30 MENU. STEQ (Store Equation) stores the equation for solving purposes. The commands 30 MENU brings up a soft-key menu solver. The soft-key menu solver is a classic solver that was used in the HP 48S and HP 48G series. In this program, we will use the classic solver to expand the capability of the UTPN (Upper Tail Probability Normal Distribution) function. The UTPN function returns the upper tail area (p) of the normal distribution given the mean (µ), variance (v), and point on the curve (x). The variables using 30 MENU are global. Therefore, it may be a wise idea to purge each of the variables after use. In this tutorial, we will create a second program to clean up the variables - this program is optional. Comments will be italicized, starting with an asterisk. * To use an RPN string in enter an equation, a second set of program brackets is necessary. * Inserts a "DONE" message and ends program entry. 1. Find the upper tail area with M = 0, V = 1, and X = 1. 2. Find the area between X = 5 and X = 15, using M = 10 and V = 5.8. 3. Find the lower tail area with M = 0, V = 1, and X = 0. 1. Find X when the lower tail probability is P = 0.95. Use M = 0 and V = 1. Remember: P is the upper tail area. 2. With M = 44.2 and V = 1.7, find the point where the upper tail probability is 55% (P = 0.55). That wraps up Part 7 of our Tutorial. Please join us next time while we explore the WHILE-REPEAT-END structure. So long for now, Eddie. Excuse me, but I must prompt you for something. 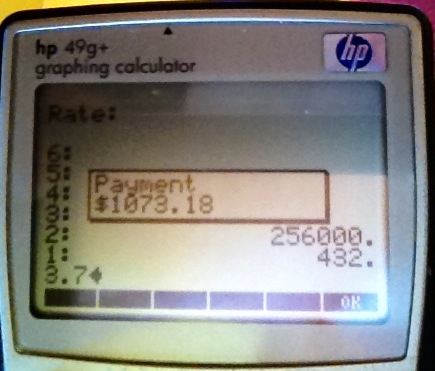 Welcome to the second week of my RPL tutorials, using the Hewlett Packard HP 49g+ and 50g calculators. Today's session will cover the PROMPT command. The PROMPT command sets the program to ask the user for input. That input can be whatever you practically want: text, numbers, matrices, and equations. The user enters the requested information and presses the key sequence [LS] [ON] (CONT) . The [LS] [ON] sequence tells the calculator that the user is ready to move on. Today we will do two programs using PROMPT: a simple program that picks an integer from 1 to N, and a more complex one that takes an equation and graphs it. This program will ask you for a number (N), the number of draws (X), and the calculator will return X integers randomly selected from 1 to N. One caveat in this program is that the numbers selected can repeat. Comments will be italicized, starting with an asterisk. You will not need to pre-load the stack with ONETO - all the inputs will be prompted for. Pressing [ALPHA] twice will put the calculator in ALPHA-LOCK mode. If you want lower case letters, press [LS] then the letter. For greek and other characters, select [RS] then the letter. During program entry, you can press [RS] [ . ] for a carriage return. This can make program entry easier to see and read. Best of all, this does not affect program entry or execution. The key [big X] is located on the 5th rows of keys up from the bottom. I will use this to distinguish the X character from the times key [ x ]. * Enters the first prompt request, "HIGH NUMBER="
* Enters the second prompt request, "# OF TIMES="
2. 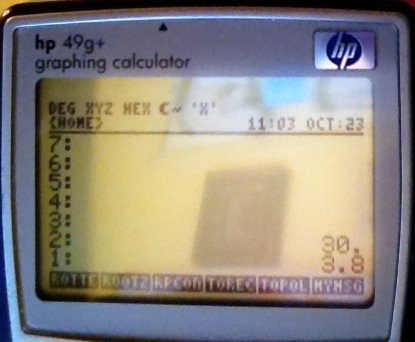 The calculator will prompt "HIGH NUMBER=" at the top of the screen. Enter the high number and then press [LS] [ON] (CONT). 3. The calculator will prompt "# OF DRAWS=" at the top of the screen. Enter the number of draws and then press [LS] [ON] (CONT). 4. The calculator fills the stack with randomly selected numbers. Use [HIST] and [ ↑ ] to view the numbers. Press [ON] when done viewing the stack. 5. You may want to clear the stack before continuing. A possible set of 12 random integers from 1-12 is: 9, 4, 7, 2, 11, 1, 10, 4, 1, 4, 1, 7. This program graphs a given an function y(x) using specified window settings. 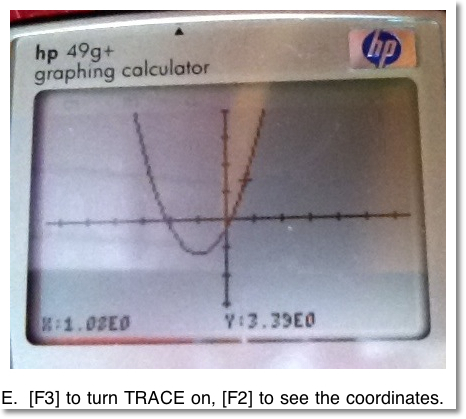 This is just one way of graphing an equation, which is an alternate way to graphing functions without using the graphing set up screens (Y=, WIN, GRAPH, and 2D/3D). The function can be traced and analyzed just like any other functions that are plotted. You can access all the commands that the 49g+ and 50g has in the catalog. To access the catalog, press [RS] [SYMB] (CAT). If you press [ALPHA] and a letter, you can quickly scroll to that part of the catalog. You may be able to get a few letters if you are fast enough. The other thing that is nice about the 49g+ and 50g is that the commands can be typed. This may be a helpful and faster alternate than trying to hunt commands in the menu or catalog. However, in this tutorial, the keystrokes I show will make use of the catalog. * XRNG: Sets the left and right boundaries of the plot screen. The left boundary is taken from Level 2; the right boundary is taken from Level 1. * YRNG: Sets the bottom and top boundaries of the plot screen. The bottom boundary is taken from Level 2; the top boundary is taken from Level 1. * FUNCTION: Sets the calculator to Function mode. * STEQ (Store Equation): Stores an equation in the EQ variable. The EQ variable is a system variable which the calculator uses to plot and solve equations with. EQ can have a list of more than one equation or expression. * INDEP: Sets a variable as independent. Useful when setting up a plot. It makes sense to make the independent variable 'X' or even 'T' or ' θ', but you can make the independent variable anything you want. * ERASE: Erases the plot screen and gets the calculator ready to draw a fresh, new plot. * DRAW: Has the calculator draws whatever is stored in EQ. * DRAX (Draw the Axes): Has the calculator draw the axes. * PICTURE: Switches the calculator to the plot (picture) environment. With all these commands to play with, let's program GRPFX. * Input the string "Y="
* Inserts the Prompt command. Leave this menu open. * Use the catalog to find the STEQ command. You can hold [ ↓ ] and [ ↑ ] to quickly scroll the catalog. * Set X to be the independent variable. * Prompt for the left and right boundaries, then use the XRNG command. * Prompt for the bottom and top boundaries, then use the YRNG command. * Input the ERASE, DRAX, and DRAW commands. * Input the PICTURE command and terminate program entry. Algebraic objects gives the user an alternative (and maybe easier) way for the user to enter equations. In Part 6, we will explore several common functions that can be used with algebraic objects. To enter 'X^2 + 3X - 1', we can enter this two ways. Assume X does not have anything stored in it. Purge X if need be. Use [EVAL] to simplify the expression. 1. Run GRPFX. All the input will be asked for you, so you don't need anything in the stack to start with. 2. At the "Y(X)=" prompt, enter a function in X. 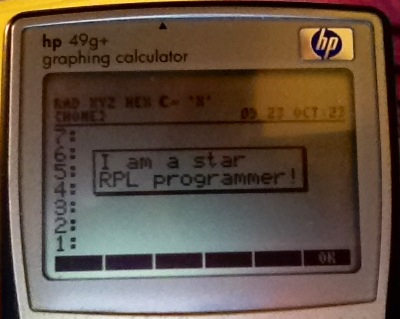 You can use RPN, an algebraic object, or use the equation writer. Please be aware that the prompt may disappear when you are entering the function, just continue. Press [LS] [ON] (CONT) to continue. 3. 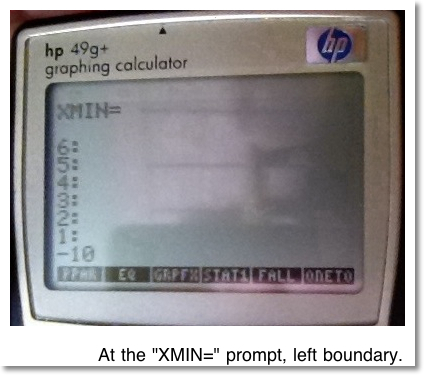 At the "XMIN=" prompt, enter the left boundary, then press [LS] [ON] (CONT). 4. 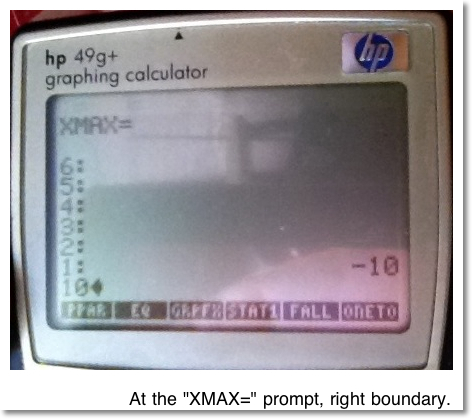 At the "XMAX=" prompt, enter the right boundary, then press [LS] [ON] (CONT). 5. 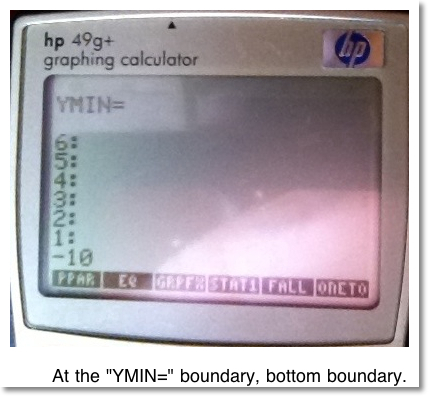 At the "YMIN=" prompt, enter the bottom boundary, then press [LS] [ON] (CONT). 6. 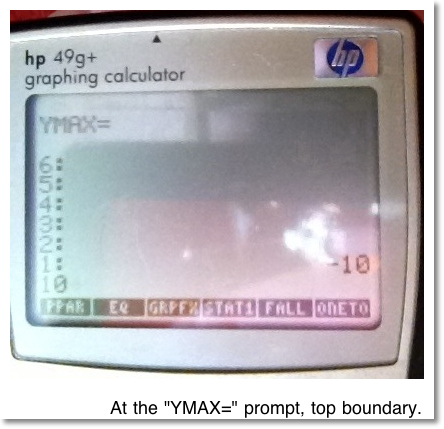 At the "YMAX=" prompt, enter the top boundary, then press [LS] [ON] (CONT). 7. You will see the function plotted. Use [F3] [F2] to trace the function. [F4] will give you access to function analysis such as ROOT, SLOPE, and AREA. Press [ON] to get back to the home screen. Hope you enjoyed Part 5. Come back for Part 6 where we explore cool functions with algebraic objects.